This page contains all of the information I have learned regarding the Silvia. Some of my learning has been via the Internet, and the people I quote can mostly be found on alt.coffee. DISCLAIMER: This information is accurate to the best of my knowledge, however, none of it is definitive. If you try any of these suggestions and break your machine, neither myself or any of the other people I quote can be held responsible. Backflushing the Silvia is NOT recommended by the Rancilio S.p.A. - Any damage you incur from backflushing a Rancilio Silvia is not covered under warranty, so performing this procedure is at your own risk - don't come crying to me if the seals on your pump fail. I repeat, this procedure is at your own risk, and can void your warranty. Despite the above, this has not stopped many Silvia owners from backflushing (click for directions). Much of this discussion is from alt.coffee posts by Randy Glass and some comments by others, notably Al Critzer. Some recommend changing your portafilter gasket every 6-12 months. Or, you can wait until you have some leakage. The gasket is installed with the rough side up and the smooth side down. If you are worried about a leak, keep a spare on hand - you'll only be out about $12. To install, empty the reservoir, turn the machine on its side, and the old gasket will come out fairly easily. If it is really crusted on, you may need to use some kind of pick to pull it off. Make sure you've cleaned all the crud off of where the new gasket will seat, or you will probably have leakage after installing the new one. The new gasket goes on easily, a simple press fit. Take off the portafilter. Look up under the group. You will see a nice big flathead screw. Get out that stubby little screwdriver that you never thought you would use, and carefully unscrew. Remove the dispersion and shower screens, and clean up with a soak in a cleaner like Cafiza, and reinstall. Easy stuff, but don't strip the screw! If you have scale buildup, you may want to use Purocaff instead of Cafiza. You may be surprised at the scale buildup, especially if you use hard water in your machine. I would not do this procedure more than once a month. From alt.coffee, Mo Brooks writes: "I have rebuilt the steam wand of my Silvia. It involved a few dollars in parts (two o-rings and a rubber valve seat, if I recall), some grease, and about 30 minutes (it only took that long because I was chatting with a friend and forgot to grease it before putting it completely back together--doh!). Not much more difficult than a group gasket. I got my parts from the company I work for part time (Coastal Caffeine), so it was just a shopping trip to the van parked out in my driveway. I expect 1st-Line or WWL will have them. We routinely rebuild the wands of our customer's machines within a preventative maintenance schedule. I plan to rebuild the wand every other group gasket change. "If your valve is leaking, you are increasing the risk of running your boiler dry, as well as causing rust problems. David Jenkins has some wonderful information on fixing a leaky solenoid on the Silvia. Someday, if I get permission, I may mirror his pages here. These changes can improve your espresso, and satisfy your desire to tinker! This was recommended so highly that when I ordered my machine, the vendor threw in the LM basket at no additional charge to replace the standard baskets. The vendor kept the original baskets, so I have no basis for comparison. The LM basket should come with a stiffer portafilter spring to help hold it in when knocking grounds out. I have been very pleased with the basket, which has a little more room in it and no ridge for your tamper to get caught up on. I have been managing some very nice ristrettos with this basket. Get one, they are relatively inexpensive once you are in this far! I ordered mine from this link - pick part number F00869, assuming the catalog hasn't changed, you should see that you are selecting a 9gram single filter basket. Here is my review of the Brasilia basket on CoffeeGeek.com. The plastic tamper that comes with the Silvia is a joke - it doesn't even fit the 58mm portafilter correctly. Go and buy a decent 58mm aluminum or stainless steel tamper. 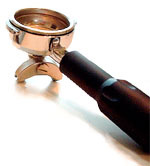 The tamper I use (pictured) is a Reg Barber with the Rancilio logo from Whole Latte Love, which cost way too much, but it is pretty and matches the machine and works VERY well. The handle is rosewood, and the base is precisely machined out of stainless steel to 58mm. This goes into the tank of your Silvia. If you use hard water in your Silvia, a water softener is a must to prevent scale buildup inside the machine. Happily, it also keeps the extra minerals from getting in your espresso! It it supposed to lay horzontally at the bottom of your water tank - some on alt.coffee stand it up. Mine is laying down, and I don't mind the fact that I have to refill the tank whenever the water drops below an inch in the tank. To recharge the resins in the softner, first remove it from the machine. Mix 3-4 tsp. of table salt with 8 oz. (250ml) warm water. Spoon it into the big end of the softener and let it sit for 15 minutes in a cup. Rinse until the saltiness is gone (I actually taste some of the water coming out to verify the salt flavor is gone). Reinstall. Theoretically, these things can last forever, but if your water has iron in it, the ion transfer to the resins can eventually slow down to the point where it doesn't work well and you can no longer recharge the softener. My father also thinks that at his home, where there is incredibly high silica content in the water, that the filter would jam up far more often. So, effectively, these do need to be replaced sometimes. - the spouts are wider and the construction is such that the flow is more even. I like it because it is easier to diagnose the pour." - the portafilter is deep enough to allow you to use the La Marzocco Swift triple basket, which holds 21 grams of coffee! I hope to have pictures up soon, and ordering information. Only available from 1st-Line Equipment. So far, reviews from alt.coffee are a mixed bag, some like it and some don't. Personally, I am having good luck with the one-hole tip, so I am not going to try this one. More on this when I have time to write it up. Greg Scarce has written about it on alt.coffee, so you can search Google Groups for this post until then. More on this when I have time to write it up. Greg Scarce has written about it on alt.coffee, so you can search Google Groups for this post until then. Greg is one of the key Silvia experimenters we have! Get a PID installed on your Silvia and control the boiler's temp MUCH more accurately. Pepe's Hodrodded Silvia page has tons of info, as does Murph's Silvia PID page... Personally, I'm not ready to try this, the espresso I am getting is awesome. But, if you like to tinker, this is for you. Yes, it has been done. And you might understand how to do it if you can read the Chinese on this page... It is nice to know that Taiwan has a modding community that is alive and well!